Let’s talk about travel gear, the stuff we’ve used and loved for 5 years of full-time world travel and the things you actually need. We travel as a family, we have 2 kids, but most of what’s on this page applies to everyone. There are a lot of travel gadgets and equipment that nobody needs, ever. We won’t tell you to buy those, promise. Use your discretion to consider your own needs and don’t buy things just because a marketer or travel blogger, myself included, tells you to. A Good Backpack for Mum, Dad, Maybe the Kids. A Kindle and Kindle Cover. Essentials! We want you to travel smarter, better and cheaper, not weighed down with expensive non-essential travel gear and accessories. There is no piece of travel gear on this page that we don’t use and honestly recommend, from bags to backpacks to packing cubes, these are our best picks but if you can, as an eco-conscious traveller, buy less not more. Consider second hand or borrowing gear from friends. You will need to have the items below, wherever you travel. electronics ( laptops, phones, kindles, cameras, video gear, power banks) with adaptors and plugs. regular, all purpose multi-climate clothes. the kids’ special bear or comforter plus a card game or special toy for long waits. 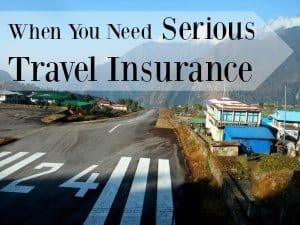 You will not need any of the following for most regular, non specialised, travel. We own many of the items below, so we carry them. If we didn’t, we’d buy them as needed. formal wear for some cruise ships and special events. I don’t write detailed packing lists. I think they’re a sales gimmick. Let’s throw the rules out of the window! Take whatever clothes you own that make you feel good. We don’t own any special, branded travel clothes or underwear. They’re unnecessary for most kinds of travel. A hat for sun or cold, the same one can do for both, within reason. What you wear is mostly personal choice. I wear jeans in every climate and have done for years. Some women like skirts, others like shorts. My husband wears jeans, board shorts and running gear, the kids wear jeans and shorts. Your own comfort isn’t the only thing you need to consider, please be aware of cultural norms in your destination country and cover up. Protect From the Sun. 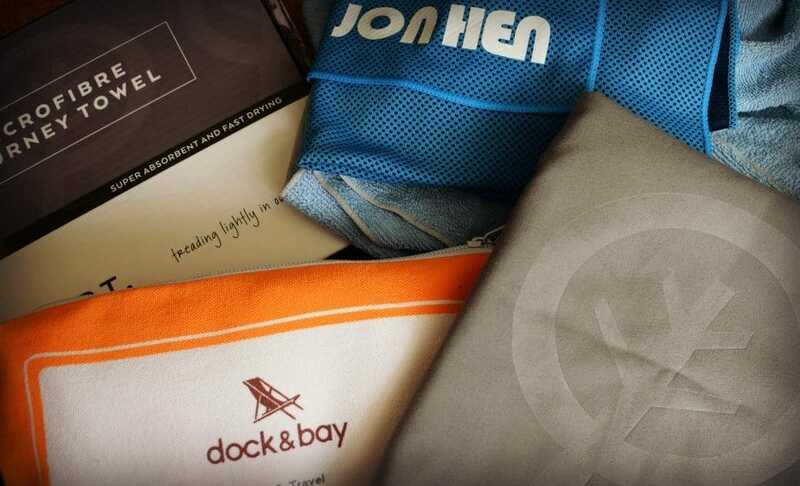 We’re very aware of how damaging the sun is, so you’ll find long sleeved T shirts and cotton shirts with collars in all of our packs along with rashies for beach and swimming. One to Wear, One to Wash, One Spare. Is a good one, but I never stick to it. Pack Less, Buy More.There are always lovely, climate appropriate clothes at your destination. Washing Clothes. Laundry is usually very easy to organise, and cheap with privately owned laundry services by the Kg in South East Asia being superb. Find them on almost any street where you find travellers, shop around for the best price. If you plan on taking whites, take enough to make up a full white wash. Expect self-operated laundries in Europe or the US, alternatively there are hotel’s own laundry service, which are often expensive. Exceptions include India and sometimes Sri Lanka or Nepal, laundry can become troublesome in those countries. I hand wash a lot of items, shampoo or hand soap are fine for this. I dry clothes on plastic coat-hangers and most things dry overnight ( even jeans) in hot climates with fans or aircon. I carry 2 hangers in my pack, it’s easier and quicker than using a travel washing line. Footwear. I carry trekking or trail running shoes and rubber flip-flops. They cover all bases, from beach to Mount Everest. Rubber flip flops are sometimes vital for showers and bathrooms so I would never travel without them to Asia. My husband normally has running shoes and flip flops, the kids have Crocs and walking shoes or city shoes as needed. I’m very fond of Mountain Warehouse IsoCool hiker socks, they’re fairly thin and light but have extra cushioning in the heel and ball of the foot making them great for running or hiking. We all have a few pairs of these. They’re also one of the cheaper hiking socks on the market. This is just one of my travel organisers and on airport days it’s indispensable for passports ph. It’s always in my day pack. We carry a selection of packing cubes and pouches for fast, organised travel, see below. We don’t think you need much. There are a few items that we love for their practical usefulness, packability and low-cost, we wouldn’t travel without them. If I were setting out into the world to travel for a while, I would recommend the following items. For most of our travel we use backpacks, for shorter trips we’ll take carry-on size backpacks. Suitcases aren’t for us, but we have a post on making that choice above. I’m a small-ish lady, I’m almost 5 foot 5 inches and I normally carry a women’s backpack that weighs in at 15-20Kg and has a capacity of 65L. I could go a little bigger. 20-23Kg is a typical weight allowance for checked baggage on planes. For years I carried a travel pack such as this Osprey ( below) but now I’ve switched to a traditional top loader backpack. It is FAR lighter and nicer to carry, I’m also in love with the various pockets and compartments however I DO still use and need packing cubes and pouches. The Osprey here is too big to be carry-on size, for that you want the 40 L version, this is what my son uses as his main luggage and carry on. Neither of the kids ever have checked luggage. The 40 L Farpoint has been with us on many an AirAsia flight, no problems so far. It is perfect European carry on size but just a touch over Asian carry on size. Beware, some budget airlines have now further reduced their carry on size to bags that will fit under the seat in front of you. Always check regulations. This is the backpack I now use , own and LOVE! 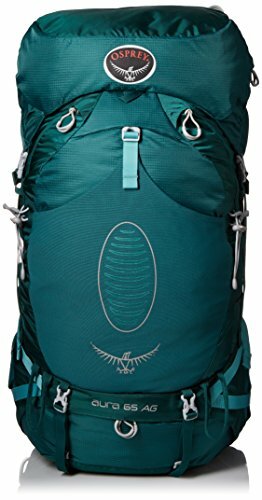 It’s an Osprey Aura 65 ladies’ pack. It’s my main luggage and my trekking pack, 65 L is a very good size for a woman to carry, plenty of room. 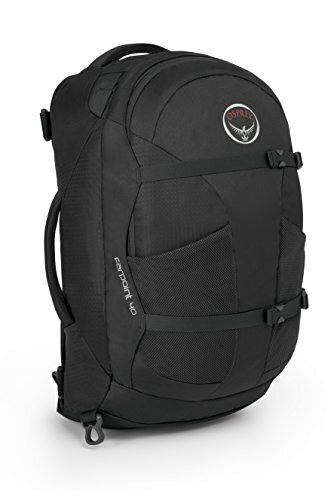 There is a men’s version of the 65 L Osprey Aura above and it’s great, but my husband prefers a bigger pack for both luggage and trekking. The pack below is the next size up, at 85 L.
My husband likes a bigger backpack and prefers a conventional design. Unlike me, he uses his big pack for trekking, he’s carried a 90L pack around the Himalayas on long hikes. 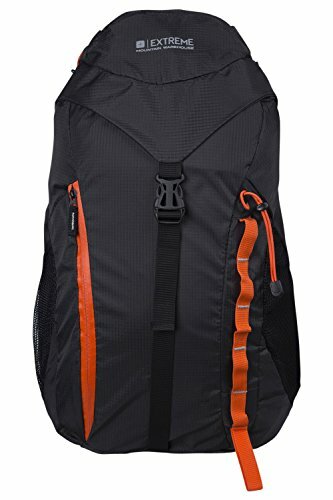 His Lowe Alpine is also now unavailable, the pack above is a good size, a good quality brand ( almost all of our bags are now Osprey) and is a best seller with excellent reviews. Kids packs, suitcases and luggage are in the kids’ travel gear section, below. We feel that after living it, travelling with kids and bags from age 6-13 years, it’s best if you don’t burden small children with their own backpacks. Once they are big enough to carry a small adult pack ( around 10 years) is the time to invest. But of course, you can buy them wheely bags, cute animal packs and so on, just for fun. 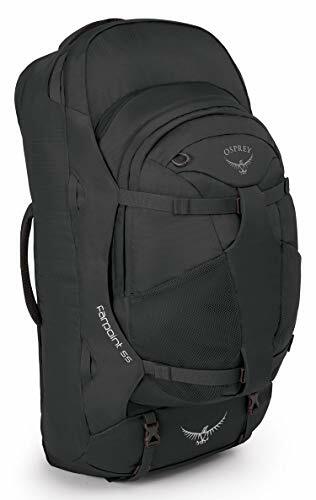 The big name in carry-on size backpacks is again, Osprey. This 40 L pack which zips open for easy access, has a padded laptop pocket and is the perfect size for European airlines. It is fractionally too big for AirAsia carry on, but we looked at bags and backpacks for the Air Asia size limits and bought the Farpoint 40 anyway. There was just nothing that came close to this standard. It’s a superb bag and we haven’t once had it checked or weighed on over 12 flights with AirAsia or Air Malaysia.. My 11 year old son carries this pack and it takes all of his clothes and toys with room to spare. It fits me and my husband.
. We bought a 3 piece set as shown below 3 years ago and they’re still good as new, mine are pink, but there’s a huge range. They work just as well for backpacks or suitcases and if you’re like me, love to be organised, you probably need to buy a set for everyone in your family, right now. 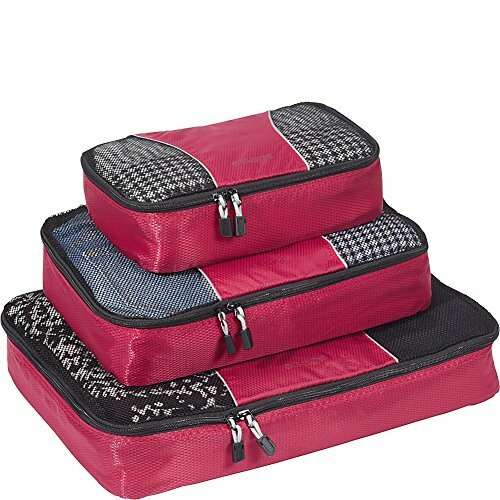 Packing cubes minimise packing stress and help you find things. I also carry a travel organiser in my day pack, every day! Our pick of the packing cubes. Our pick of the organisers. 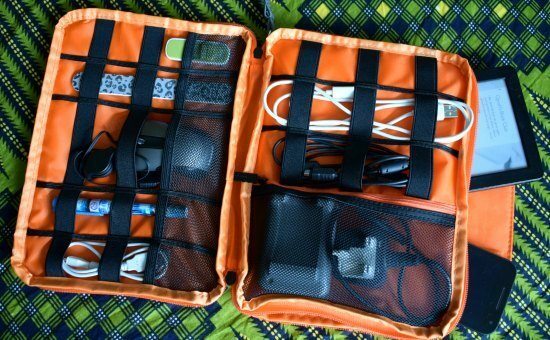 For other packing cubes, pouches and sets, see our post on travel organisers here. They’re also great for nail files, pens, note books, makeup, or jewellery, passport, cash, phone etc. 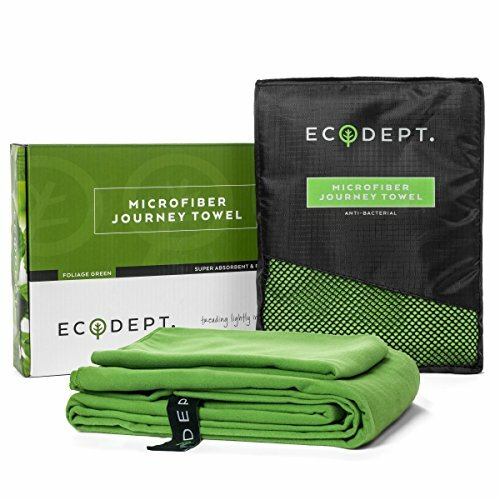 We’ve tried multiple travel towels and the one we recommend is the soft, grey, large Eco Designs towel bottom right. Click through below to see our findings or buy now using the button below. A family needs multiple travel towels in a variety of sizes. We own several, enough for our lifestyle and together they take up less room than one large bath towel. We’ve done some research to find the best, nicest travel towel available today, and the winner was the soft grey towel bottom left in our picture. A larger size travel towel is great because some of us like a towel that wraps right round us after a shower. I go for 150 cm or 180 cm. These travel towels can also make good impromptu blankets or clean sheets. They wash and dry quickly and easily and I never leave home without mine. We’ve owned Mountain Warehouse towels for years but our new favourite is the one below. It comes with a tiny hand sized towel as a useful bonus and its good-looking presentation box makes it a great gift. If you can’t find the EcoDept Jorney Towel above in your country, Mountain Warehouse large or extra large size travel towels are also good, see here. Choose microtoweling or microfibre, both work. Some travel bloggers will tell you that you don’t need a travel towel, we’ll tell you that you do! As a young single traveller I managed with a sarong, now, as a more mature mum, I want towels. You won’t need to use it all the time, but on those occasions when you do you’ll be glad you bought one. For trekking you will need one, also for some hostels and budget guest house. If you are taking a day trip to any sort of swimming hole, waterfall or river activities, you’ll need a travel towel. We even use these “at home” in London and Romania, they’re so much easier to machine or hand wash and dry. We’ve found a winner! Chef and I love our Sungod customisable sunglasses with lifetime guarantee. Click on the image, or below. Protect your eyes, it’s absolutely essential. We’ve found a brand that we LOVE and want to recommend to you. I’ve always bought Oakleys, they were the only sunglasses that I found impossible to break thanks to their arm to frame pop out hinge. If an arm comes off, you just snap it back in. Now we’ve found the same feature at a lower price poit and it comes with a LIFETIME BREAKAGE GUARANTEE. That’s amazing! We’d like to introduce you to Sungod. Visit their website, customise your eye-wear, choose from frames, styles, colours and mix and match. 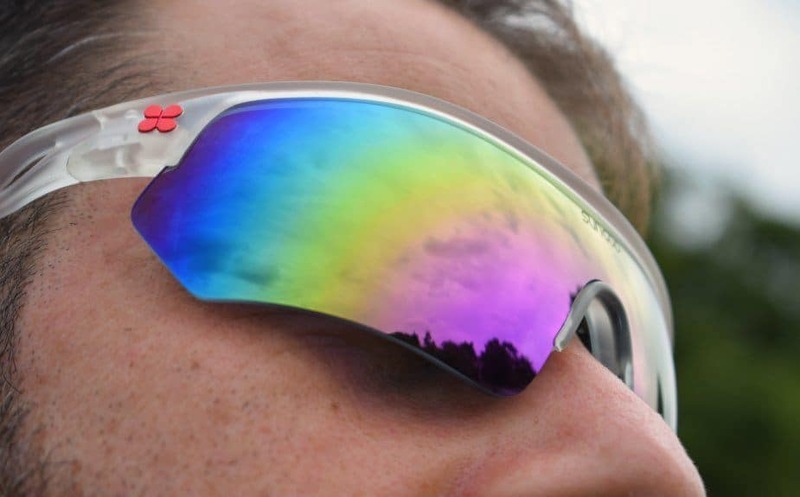 Order your custom designed glasses and your pair will arrive in the post the next day, we’re huge fans. Chef uses Sungod PaceBreakers for his Ironman events, he says they’re the best he’s ever owned. Less sporty, more fashionable frames are also available. For straight up, regular travel or a family gap year, you don’t need any special travel watch. A multi time zone feature would be nice, but really, no, you don’t need a travel watch. However! If you are trekking, hiking, climbing mountains, running, skiing, sailing, cycling or taking part in any kind of outdoors activity, think about getting a watch with GPS. Because my husband is an Ironman triathlete, he adds a heart rate monitor with chest strap to his travel watch requirements. If you are doing these sorts of activities, take a quick look at our post on trekking watches ( 2018) and see if you think you need one. We can’t carry books and book exchange shops are becoming rarer on the backpacker circuit. You need a Kindle, or 2 or 3, I lost mine to my son quite a while ago. You can download your guide books onto Kindle, fill them up with first readers or young fiction and use them for school work. 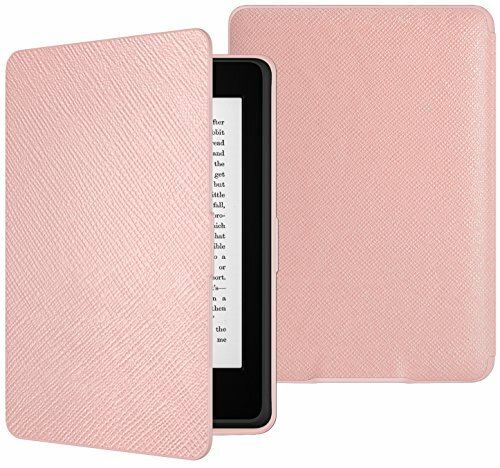 Buy a Kindle cover at the same time, they’re essential to keep them safe. 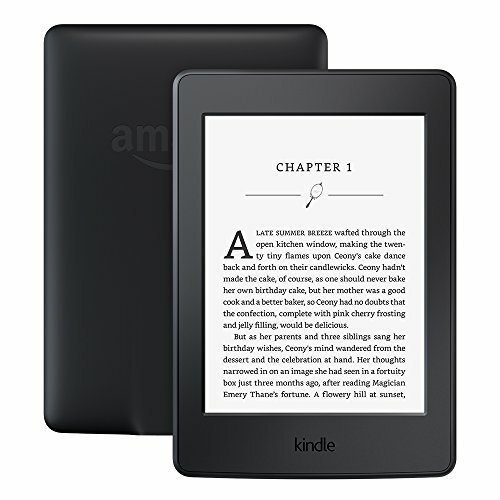 Check you have the right size / year case for your Kindle Paperwhite as designs do vary. We prefer the Kindle Paperwhite, 6″ for reading, I’ve read that the Kindle Fire isn’t as easy on the eyes and giving the kids the options of built in games just isn’t so smart. Most families carry a lot of electronics. That makes keeping them powered up essential and adaptors a very important part of your family travel gear. 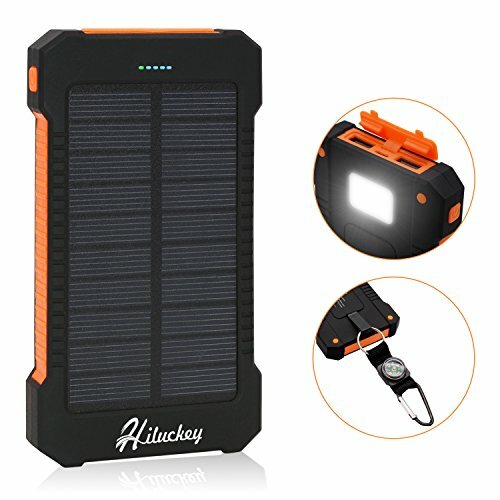 These days we carry solar powered rechargeable battery packs and we find them great ( freaking amazing!). You can find a full review post on rechargeable power packs and chargers here. As we are professional travel bloggers, this is something we need to get right. After years of using a DSLR I’ve switched to phone only for photos and videos and the results are superb. I’m currently using a Motorola twin lens phone, waterproof and with gorilla glass, those are 2 vital features to look for along with good photo / video capabilites, quick charging and long battery life. 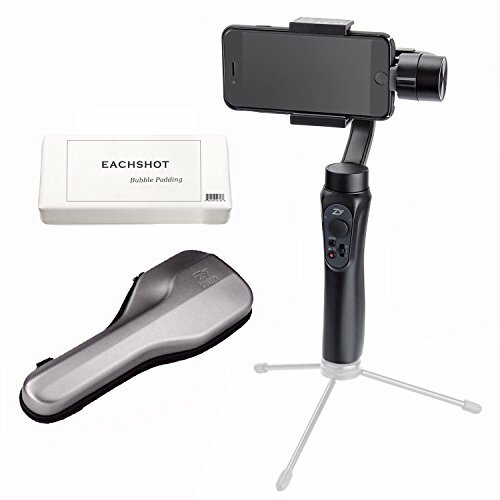 Two gadgets that we hugely recommend to take your video to the next level are below. Both are relatively low cost, the microphone is tiny and the gimble / stabiliser is a lot easier to pack than a DSLR. You can buy an add-on for the gimble to turn it into a tripod. 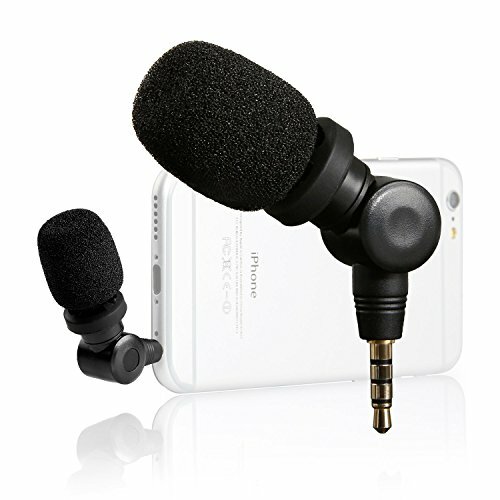 This tiny microphone plugs into your headphone jack and will make your sound quality off-the-scale better, be it picking up background sounds, cutting wind noise, or talking to camera. One of the best things I ever bought for just a few bucks. My new toy, oh how I love it! Super smooth video while walking or panning, it’s just fantastic. The DJI Osmo Gimbal is very popular ( DJI make some of the best drones on the market). We went with the Zhiyun, above, it was cheaper ( roughly half the price) and so far we’re very pleased with it. You can see theDJI Osmo here to compare. The drone I want, but don’t yet have because it’s been out of stock, in the DJI Mavic Air ( see here). It improves on both the Mavic Pro and the tiny Sprite, to give all the features I currently want in a drone. When I get my hands on this new baby I’ll let you know how it performs. The phone I use for photography and video is very similar to the one below. 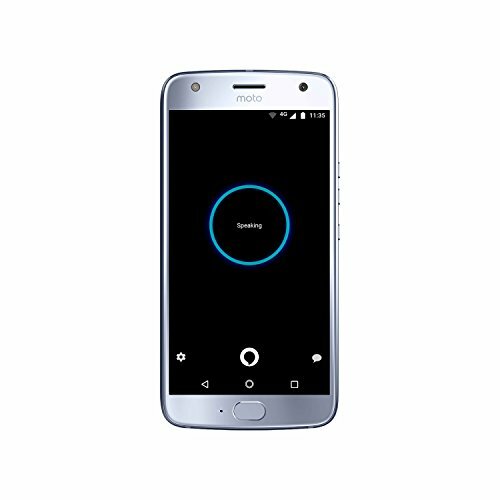 Models change all the time, but I went with a Motorola rather than the new Samsung or i Phones because it’s got the features I want, the more expensive phones didn’t at that time. Our whole family are big Lenovo fans and our latest laptops are from the Lenovo Ideapad range. 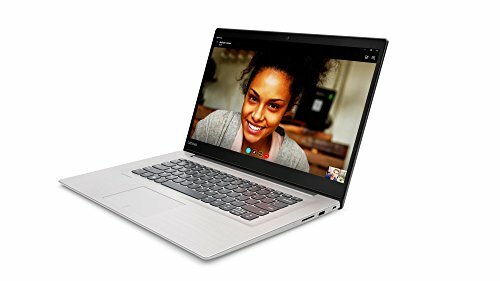 I own the model below, it’s smaller and lighter than my old Acer at 15.6 inches and that makes a huge difference to me. It has an i5 processor and heaps of memory making it suitable for video editing, something I couldn’t do on my old laptop. Mine is a 320S below, but check specifications and your needs, there are so many variables. Mine came with Windows 10, many we looked at didn’t include this. We have a full post on travel laptops here. We love our Siggs! Sigg water bottles are the Rolls Royce of the water bottle world. Yes, you’ll probably need one, most certainly for any sort of adventurous travel, particularly trekking or hiking. Sigg water bottles are clean, green, BPA free, ultra stylish and pay for themselves. We have tried cheaper bottles from supermarkets, the lids broke. Our Siggs are over 10 years old now and we love them. We tend to use Nalgene bottles more for trekking, it’s personal choice. If you’re not sure that you’ll need one, don’t buy one, they’re bulky to carry. Our kids have their own water bottles, view Kids’Siggs here. 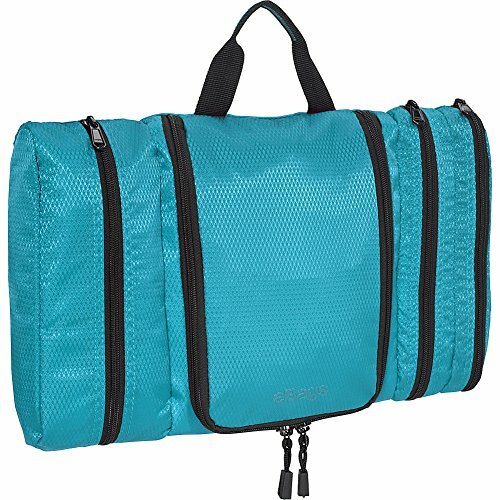 We’ve recently discovered the perfect travel washbag. Why perfect? Because it’s lightweight, light on bulk and it’s FLAT. Your washbag is usually the last thing you pack and the first thing you unpack on arrival, this washbag is designed to make your life easy. A flat bag is far easier to fit in the top of your suitcase or backpack. On arrival just grab it, unzip the centre compartment, and hang the whole thing from a bathroom hook. When you undo that U shaped zipper you’ll find a hanging point inside and every pocket can be accessed easily while the bag hangs. A wash-bag is much better hanging in your bathroom that sitting on a wet or grubby washroom surface ( in shared hostel showers it’s a dream). The centre pocket is great for small items, even make up or jewellery and multiple pockets keep all of your wash gear organised and clean. The bag is big enough to take my hair brush and gel spray in one packet, toothbrushes and paste in another and both stay clean, hygienic and dry. My solid shampoo slots in their easily too. Solid shampoo not only helps you save the planet through using less plastic, it makes carrying it easier, less mess, no liquid bans in carry on. I’ve been travelling with my E Bags Pack it Flat for over a year now and honestly love it, it’s one of my favourite travel items and makes travelling that little bit easier on everyone. This is another item that would make a great gift and is loads better than the old style hanging wash bags. We once owned one of those and threw it out because it was too bulky and heavy, this one isn’t. For the mums, yes, it will take the whole family’s toothbrushes if you need it to. We travel full time, so little miniature travel sized pots and bottles aren’t part of our family travel gear. But, for short trips, where you can decant from your large bottles at home, they are sensational. I own an excellent set from Avon, with lids that seal vacuum tight and never spill, I used to use them for vacations in our pre-nomadic days. If you want to travel carry on only, make sure they are under 100mls and keep them ready in a clear plastic bag. Lonely Planet have been our guide book of choice for many years. OK, these days you can do all of your research online, but for me, nothing beats having a copy of The Planet in my daypack. It’s handy for learning about the country’s history, culture and food along with working our exactly where we want to go. Lonely Planet give you plenty of maps, hotel and restaurant recommendations and an introduction to the local language. Totally awesome, we love them. For the last couple of years we’ve travelled without a guide book because of weight restrictions, but for our recent trip to Romania I went out and bought myself a hard copy. It was like running into an old friend again. We think it’s a great idea to get children interested in a destination by finding books about that area. This goes for simple picture books for toddlers right through to travel novels or histories for teens. It’s best to get them interested before they leave home if at all possible. Obviously, we prefer Kindle books, but if you’re not long-term travellers, you can buy the real thing. It’s a great idea for adults too, we love our travel literature. We’ve published a post on best travel reading for India, more are to come. A lots of people ask me about kids travel gear, quite honestly, they don’t need anything special for kids, just clothes and a very few toys. Older children need their own backpacks or luggage, but sometimes I still carry my younger son’s gear in my big bag. We find that the more bags you have, the more complicated travel becomes and the higher your risk of losing one. Most families share wash bags, medical kit, towels etc. 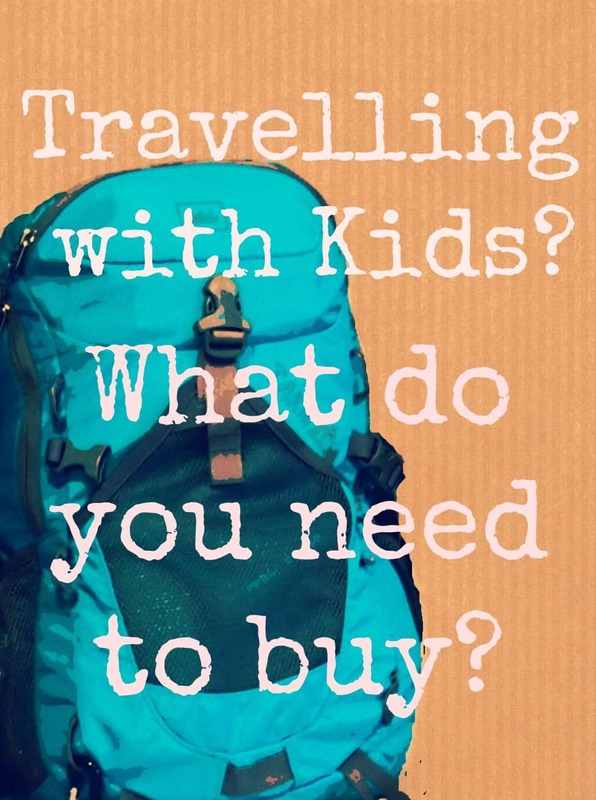 But there are a few pieces of gear I’d recommend you pack for kids. Hover over this image to bookmark to Pinterest. Thanks! Obviously kids’ paracetamol is in there, I’m very glad that Calpol (UK) now do solid, chewable tablets for older kids rather the bulky, sticky syrup bottles. Panadol (Australia) also do chewables now. I don’t know what’s available in the US, sorry. 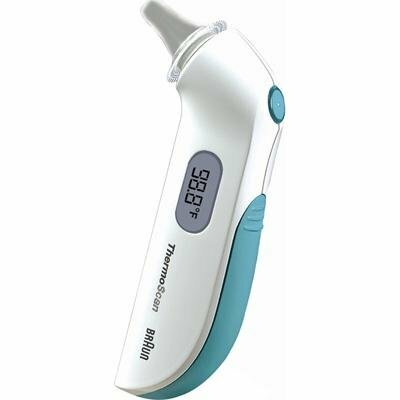 The only special piece of medical kit we carry because of the kids is a compact electronic ear thermometer , it’s by Braun and I love it, it always tells the truth and lets me know if I should panic or not. We carry with a monster array of electronics for working online, photography and electronics. We generally have phones, chargers, laptops, a drone, at least one trekking watch, a gimbal, microphone, bluetooth selfie stick GoPro and a selection on lenses for underwater and scuba photography. Find details on these in our travel essentials post. Hopefully, you don’t need to carry as much as us! Can you travel with just your phone as all the laptop and camera you need? Yes, absolutely you can these days. But take a look at the post above, see if anything hi-tech jumps out at you. We certainly need a travel laptop for business, planning and the kids’ education. Do the kids need electrical travel toys? We think not. Kindles are essential for us and older kids love phones and music players, but for little ones, no, they don’t need them. My boys, at 6 and 8, started with little 18L kids backpacks like the blue one in the above image. They were cute, but not great packs. The hip straps never stayed snug so all the weight was on their shoulder straps. They were more hindrance than help and mum generaly ended up carrying them. 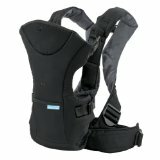 My elder son, at 9, graduated to a 45 L small adult pack, it was only half full so not too heavy, but the great harness design and air flow cooling system made it much more comfortable for him. It’s a Mountain Warehouse Extreme pack and we’re all very pleased with it. We adults and kids all use this one as hand luggage from time to time, it works great if you want to fly carry-on only and I used it as my trekking pack during our first, shorter Everest region trek. It’s a good buy. Trunki bags are all the rage with trendy travelling tots at the moment, sensational for little ones as they can take a rest in long airport queues by sitting on these robust rollers. Some people travel with travel towels, sleeping bags, liners, mosquito nets, crampons, waterproofs and scuba gear. Most people don’t. Of the above I’d say that picking the best travel towel for you is a good idea. A nice big one, whether or not you get one for each child depends on you. The other items depend on where you’re going and what you’ll be doing, kid sized trekking gear, scuba gear, everything, is available but harder to track down. Essential kids travel gear for us, are sun (UV) protective rash vests or sun sirts ( rashies) ideally long sleeved and high necked. They wash and dry quicker than T shirts and cover your child’s delicate skin more completely. In some parts of the world, including Queensland, our former home, a one piece stinger or sun suitlike the one above is needed at certain times of the year. 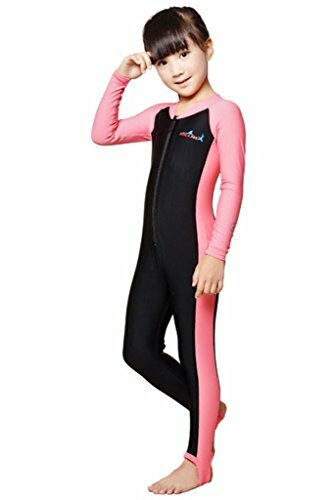 They do double service, protecting your child from potentially deadly jellyfish while at the same time keeping them sun-safe. If you’re planning on snorkelling anywhere in tropical seas, get one. Jellyfish can be deadly. The Australian reef boats carry them to compulsory hire to visitors, but having your own for the beach or reef is great, much less hassle than sunblock, pain or (possible) death. Other than these, we take no special gear for the kids at all, they just have sun hats, regular shorts or long trousers, T shirts and long sleeved shirts. On their feet they wear Crocs or similar. They can walk just fine in them, they love to be able to slip them on and off easily and they’re water-tough. If you travel with kids you’ll know that every special toy has to go with you. That’s the bears, blankies and general comfort items that the kids can’t be parted from. We also carry some travel toys and games to keep the kids amused at airports and bus stops and when we’re just hanging about. You can find our favourites in our travel gifts post. 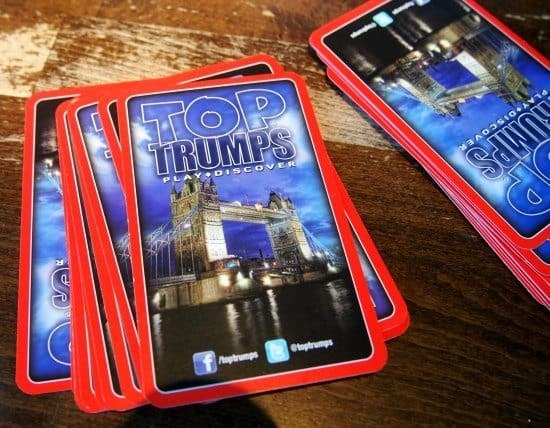 Card games like Top Trumps ( above), Monopoly Deal and UNO are our absolute favourites. Keep it simple with travel changing mats to reduce bulk. All you need is a clean, slightly padded surface that you can wipe with antibacterial wipes or sanitiser so that you KNOW it’s always clean for baby. 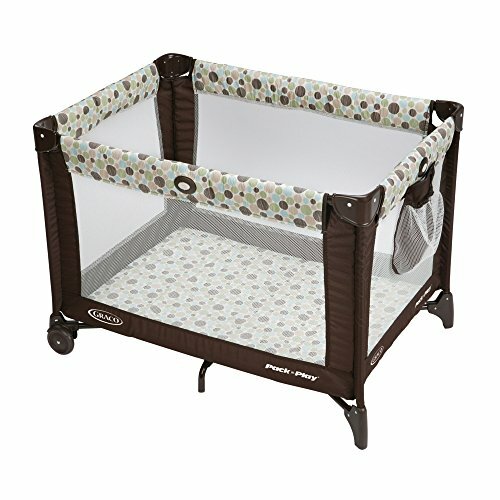 The Graco Playard is as simple and pared-down as you will find. A travel cot needs to be lightweight, these things are heavy! We carried our Graco all over the world and it saw us through 2 babies. The ultimate baby hands-free-kit. 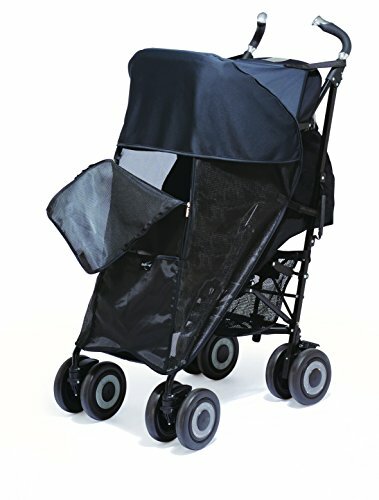 On uneven pavements and dirt tracks you’ll be very glad to have a sling not the stroller. 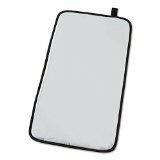 Two baby travel accessories that we always found absolutely indispensable were a UV and mosquito protector for the buggy and a baby mosquito net. We used the Shade a Babe mosquito and UV protector for years, both boys always slept better under it, protected from bugs and sun. There’s no way you will ever travel light with a baby, but luckily the big gear, like travel cots, are not generally included in your airline baggage allowance. We’ll never try to sell you something you don’t need and we only recommend travel gear we actually use, that’s a promise. 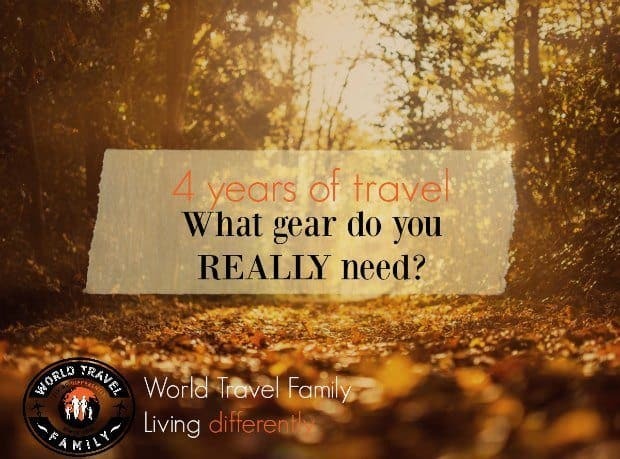 Over the last 5 years of full time travel we’ve had plenty of opportunity to figure out which travel equipment you need, which you don’t.If you’re more interested in the electronics we carry with us, you’ll need our travel essentials post for full details, as mentioned above. We make a point of trying new products to find the best gear currently available in 2019. Keep an eye on this page, we add great new travel products as we find them. Awesome list! I always love seeing what gear other families are finding useful these days. Pick up some tips and try out new things to see if it can make the travel experience a bit better. We personally love using our packing cubes as we all share suitcases and find that backpack style carry on for the kids keep them from complaining less (in comparison to the wheelie ones). Hi, I really like the trunki bag but I have already purchased it and since then my daughter plays with it during our travels. 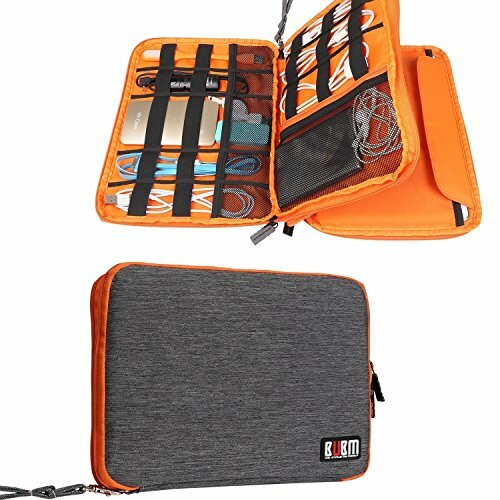 I like all the accessories you mentioned in your blog and I am looking for a backpack for my 10 years old son. I will surely buy it to make him happy too. Thanks! Thanks for the list, its helping me a lot. What car seat did you use for your boys when traveling thru Europe? I’ll be traveling with my 3 year old for 4-6 months. we used our British car seats Aimee. Thank You for sharing this blog. I will certainly plan our trip with my kids as per the items mentioned on your blog. I agree on the water bottles. They have been so key for us. I just wish my kids would stop losing their bottles! Great post! We’re about to head out for a year away and I’ll refer back to this often as I pack up everyone’s stuff. Our kids are 3 and 6 so we got them 12L and 18L backpacks, respectively, with the expectation that they carry their own entertainment, snack and a change of clothes at a minimum (big boy can probably carry most of his clothing as well). Can you tell me more about the flat wash kit and what you have inside? Just the usual Melissa, solid shampoo, conditioner ( I have very long hair, can’t manage without now). Razors. Soap stolen from hotels. Just all sorts of junk. We usually keep the toothbrush, toothpast separate to pull out quickly from the top of a bag when we need them. This is a great reference list! I always miss something when it comes to packing. This is really helpful. Thanks for sharing. I’ve often thought about taking the kids to the beach, and i’ve just as often thought about what would happen if one of them got nailed by a jellyfish. I never once thought to look up stinger suits. Why did I not know about this? Best idea ever! This is a great list. We are looking to upgrade the little guy to a backpack of his own soon as the case can be a nightmare when we are taking backpacks on a long trip! Never thought of taking my thermometer before this but I certainly will now! Great ideas. Yes. Travel towels are more important as you travel with family. I always take a money belt and Swiss Champ as well. Great reference list! I agree that a lot of “specialty” travel items are just gimmicks. If it works for life in general, it’s usually just fine for life on the road. Just as a heads up, children’s Paracetamol (sp?) is widely available in North America in chewable form under the name acetaminophen or the brand name Tylenol. Well done! You are right, far too many ‘travel lists’ are simply aimed at links and promotions. you have a sensible and pragmatic approach. I let the girls pack last year and we were going for over 10 months… onesies were a ridiculous inclusion… but worn loads in the caravan in winter! When I have time Janine,but thanks for the nudge! Thanks for letting me know Gerry, I’ll try to fix them today.